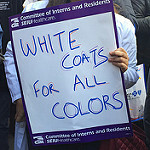 While some may find relief that the revised immigration ban does not apply to valid visa holders, the damage is already done – many hospitals this year chose not to hire highly qualified resident physician candidates from the seven countries in the original Executive Order because they didn’t want to risk having unfilled slots if those physicians could not enter the United States. The Trump administration’s second attempt at an immigration ban still contradicts the values that our country was built on, and the values of our profession. To suspend refugee resettlement for 120 days is unconscionable and may result in preventable deaths. We have already seen heartbreaking stories of children awaiting emergency medical care in the US whose visas did not come through before January 27, 2017. Allowing this to continue is inhumane and unacceptable. Immigrants have long been the backbone of the United States, and restricting entry to future visa holders solely on the basis of their national origin is not part of our core identity as Americans. On a practical level, barring people from specific majority Muslim countries means fewer doctors available to treat patients in underserved communities. More than 7,000 physicians from the six countries targeted in the ban currently treat patients, many in areas already facing a doctor shortage. Over 100 physicians from those 6 countries are resident physician members of CIR working 80 hour weeks in safety net hospitals around the country. This Executive Order means weakening the healthcare system and denying access to some patients. And it means losing out on the potential contributions of professionals in the tech industry, in science, in academia, and in medicine. On top of that, it means separating families and communities. This is not who we are. Our message for immigrants who are being targeted right now is this: whether you’re a bodega owner, a nurse, a doctor, a hotel worker, a taxi driver, a scientist, or anything else: you belong here and we stand with you. We call on the President of the United States to rescind this ban and for people of conscience to reject the Islamophobic rhetoric and false assertions about immigrants that aim to keep us divided and afraid.